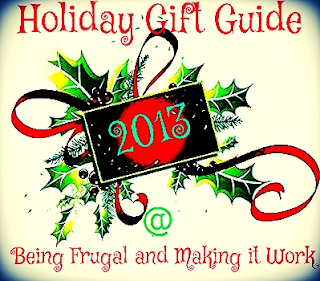 Being Frugal and Making It Work: Holiday Gift Guide Giveaways - Enter to Win Your Gifts for Christmas! Holiday Gift Guide Giveaways - Enter to Win Your Gifts for Christmas! Have you started your holiday shopping yet? If not, now is the perfect time to start, as there are lots of great holiday gift guide giveaways to enter this year! Last week I won a holiday DVD, $25 Walmart gift card, and 6 Harlem Globetrotters tickets! Have you entered (or won) any holiday gift guide giveaways recently? Wow that is am impressive list you have there. I will be entering a bunch of these! That is a big list of giveaways! I will have to keep checking back to see when the others start! Thanks for sharing! Fantastic list!! I'll keep an eye out for the great giveaways! Great list of products, I can't wait to enter all your giveaways as they are posted!! If only i lived in America! The cake pops look like fun! Cannot wait to see more! That is a great list of holiday gifts in your giftguide! There are definitely a lot of fun and exciting giveaways about to happen! Thank you, I am trying to enter as many as I can - it is always fun if you win! What a great opportunity for people to try to win some things and take the pain out of holiday spending! I wouldn't mind winning those chocolate ones. I'll tell myself they are medically necessary to help me with holiday stress. Fantastic list of giveaways!! I can use so many of them!! I'm going to enter a few of these! Ooo, can't wait for the build-a-bear giveaway to start. My daughter has been "hinting" that she would love to pick out her own bear. when I don't win:) However, a list this impressive may start me on a more positive track of thinking and hopefully winning this year! Those are some awesome giveaways. I'm off to enter some of these, thanks! Great giveaways you have going on!